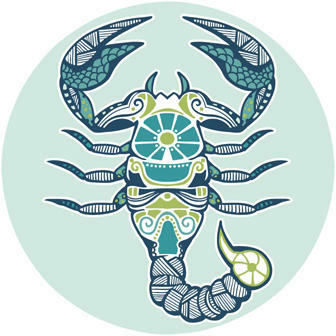 Scorpios (sign: ♏) are cooperative, responsible and diligent. For outer aspect, they seem to be calm, but inside they are dynamic, need contacts, and they have superb intelligence. Scorpios, Cancerians, and Pisces are long distance runners – they possess inner knowledge about the spell of time. They avoid risks. They typically wear their hearts on their sleeves. After using a keen eye, words find honest and direct communication. Their communication is skillful and smooth. Scorpios are quick - marked by a rapid reaction. They realize and recognize fast. They might wait for the right moment, and then they find the opportunity to hit. They are quick at repartee, and so they get the chance to win and to defeat their opponent. Generally, they win – simply for just the moment anyway. When they are in difficulties – feel like pushed into a corner – they become stronger and are much tougher than the other zodiac water signs. Sometimes there is left no word to say. But lastly, they have the wisdom and confidence to solve any problem and find the appropriate decision. So maybe for that reason, they tend to create problems – somehow. They have presentiments – or possibly premonition. Scorpios are convivial coevals. Meetings and phone calls could continue for hours because they keep tenacious. They like to have people around them – just sometimes they prefer to stay alone. They have the intention and the strong will to effect and affect. Nothing should be let out and room and time are just space to share. Without any doubts, they have great moments and time, and ambition is on their side. Being that way implies having a side of arrogance and sublime – means to be faithful and confident in life. Often they are bright winners, or just their projects sink like a stone.There is nothing in between. Nothing else matters. Cooperative, responsible, reliable, calm, sublime, dynamic, diligent, humorous, intelligent, skilled, convivial, strict, keen-witted and discreet. Perfidiously, cold, weak, disorientated, labile, devious, sublime, dogmatic, envious, insincere, virulent, vicious, querulous, intolerant, inconsiderate and indelicate. Which zodiac sign are a perfect love match?